Apparently as a part of the recently announced season pass add-on DLC for the upcoming Borderlands: The Pre-Sequel, players will get to take on the role of the charismatic Hyperion employee Handsome Jack on his meteoric rise to power. Well... kind of. "I am definitely Handsome Jack, I am not a body double." What we will actually get to play is a Handsome Jack duplicate. One might assume this will be similar to one of the Bodyguards or Body Doubles that we got to encounter in Borderlands 2's main campaign mission "The Man Who Would Be Jack" in the Hyperion location called Opportunity. 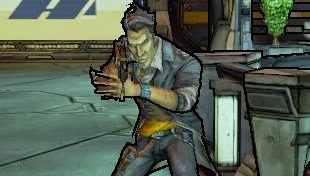 Another new Playable Character idea- one of Handsome Jack's doubles. Maybe even a Handsome Jack New-U spawn that gets messed up in the spawn process. He could have a ButtStallion special or some such. What about calling in Hyperion forces, maybe a Moonbase launched robot? Will they be another Hyperion Engineer with very unenthusiastic responses? Will they have a Jack's Pocketwatch special ability that can call in backup? Will they have a digistructed facade over their regular body? So many questions about this new character.